as praised and explained by Ton Jaspers (W5011) .. I have just been reading the Weekly Whiffle and again it struck me that the cascade kicker system isn't mentioned in the WIT pages. (see attached picture). I have copied the set-up with the two three-sheaved Harken blocks from the WIT pages. It works perfectly well, yet I advise anyone against it for reasons of cost. The two Harken blocks will create a serious hole in your wallet. The cascade system, on the other hand, costs less than half the Harken set-up and is just as good (16:1). The cascade is also the standard kicker system Porter Brothers puts on new boats. It is easy to put together yourself but can also be mail ordered ready made from Pinnell & Bax (England). (It's a stock product with P&B). Also any local chandler should be able to put it together. The lever option you have on Shades is in my opinion only good for experienced sailors. It is so strong that, unless you know what you are doing, you could seriously bend the boom with it or break parts. Also I think it is hard to set-up correctly by the inexperienced. I have no idea how it compares, price-wise, to the other solutions. Other than that, you need three pieces of wire, each with two swaged eyes. One of the eyes is swaged around the pin of the block (see image below). The three eyes that are not on blocks are put together on the mast with a shackle. 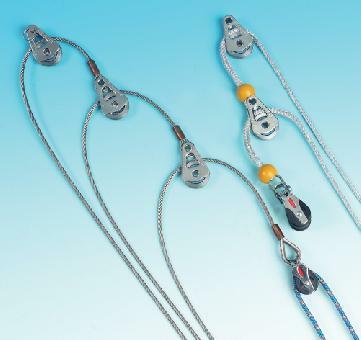 The top block is shackled to the boom, directly or with a small piece of wire. When a small piece of wire is used, one end can be swaged around the pin of the block again. When this is done there is one wire eye still unconnected. This eye goes to a standard block (Harken 082, Ronstan 20101, Holt 2020, etc). From this block a line runs over two cheek blocks positioned left and right on the tabernacle (at about the same height as the shackle that connects the three wires to the mast) and from there to cleats on each side of the thwart This is similar to all other kicker systems. When using Dyneema rope instead of wire, bowlines replace the swages. If you are making your own system, pieces of rope can be used in a similar way to determine the exact length that the SS-wires will need to be. FLASH!! Click here for photos of the actual cascade vang system on a Hartley Mk IV.